The NHS doctor freed after allegedly being held captive by her family in Bangladesh has said she was forced to marry a man "under duress" last month. Humayra Abedin, from east London, said her parents had chosen a husband for her and she was now "urgently" pressing for the marriage to be annulled. 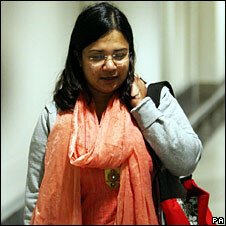 The 33-year-old arrived back in the UK on Tuesday after the High Court in London ordered her return. She had moved to the UK in 2002 and was due to start work as a GP in August. However, she travelled to Dhaka when she was told her mother was ill.
She appeared to have been held captive at her family's home and then at a psychiatric hospital following claims she could not make decisions for herself, the BBC's Mark Dummett in Dhaka said. British authorities were contacted after she managed to send messages to her friends in the UK. And the High Court in London then served her parents with an injunction, ordering them to free their daughter and let her return to the UK. "On 14 November 2008, I was forced to marry a person of my parents' choice," Dr Abedin said in a statement issued through her lawyer. "I was removed to another province of Bangladesh. "I entered into the marriage ceremony under duress. I did not consent to the marriage. "I have given my solicitors instructions to urgently issue proceedings in this country for a decree of nullity to be obtained on my behalf." Dr Abedin was released into the custody of Dhaka's High Court and then the British High Commission on Sunday after her parents were ordered to appear before a judge. Their actions were "not acceptable", Judge Syed Mahmud Hossain said.